Eastern Shutters offers a full line of impact rated and decorative products. All orders are engineered for your specific needs while remaining affordable. Eastern Shutters proudly manufactures and provides qualified set up. These products provide a decorative look, protect buildings from storms, and adds privacy to your home or business. Eastern Shutter’s products which are designed for Impact are approved to meet Florida Building code for High Velocity Hurricane Zones. 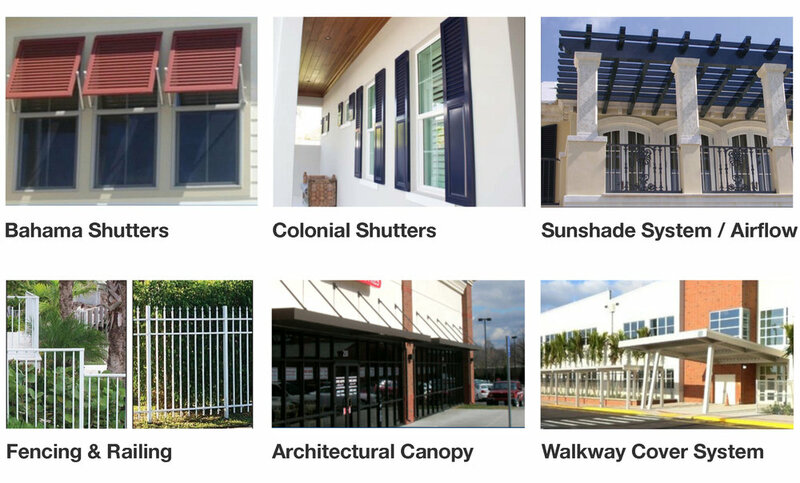 Eastern Shutter’s Roll Shutter system provides superior protection from nature’s rain, wind, or sun when needed and the full visibility to nature when they are not needed. The Roll Shutters system can be driven by a manual system or a motor with smartphone and keyless options. We manufacture Accordion Shutters to protect your prized architectural structures that need to be protected during wind, rain, or sun. We can design shutters for the most complicated designs. The Bahama Shutters manufactured by Eastern Shutters are our most popular product. Bahama shutters provide a unique look that increases the architectural appeal of homes/offices. The of Colonial Shutters manufactured by Eastern Shutters offer the traditional look that has withstood the test of time. Our “Wood-Look” shutters fit the architectural designs of today’s demanding market with the strength and durability of aluminum.